Bank-robbing surfers: if that theme doesn’t define “Hollywood high-concept”, I don’t know what does Despite the silly idea behind Point Break, the movie itself actually provides a fairly entertaining experience in which the caliber of the action generally outweighs the goofiness inherent in the project. At the start of Break, we learn of a group of long-time bank robbers whose professionalism has made their whereabouts a total mystery to law enforcement agencies. Called the “Ex-Presidents” because they sport masks of Reagan, Carter, Nixon and Johnson (poor Jerry Ford! ), these slick crooks work a seasonal schedule and elude all attempts to nab them. Cocky young FBI agent Johnny Utah (Keanu Reeves) joins the detail when he learns of his new partner’s theories about the Ex-Presidents: Agent Pappas (Gary Busey) thinks that the robbers are surfers. Others berate this notion, but he finds lots of evidence to back up his ideas. He gets Johnny to agree and then go undercover to infiltrate the surfing subculture to get a bead on the thieves. During his pathetic attempts to learn the sport, Johnny meets - and promptly falls for - surfing babe Tyler (Lori Petty). Through her, he connects with one of the local surfing cliques, one led by shaggy philosopher Bodhi (Patrick Swayze). As the film progresses, Johnny gets deeper into the group while he tries to find the culprits and solve the case. 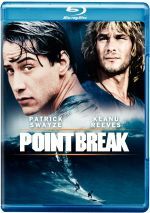 That storyline doesn’t state anything that would make Point Break stand out from a slew of other crime-related action flicks, and it’s really the surfing element that creates an unusual demeanor for the movie. The change of scenery adds a nice tone to the film that helps it avoid a generic quality that otherwise might have harmed it. Point Break doesn’t quite fire on all cylinders, but it manages to overcome most of its potential problems. Key among the probable trouble spots was the movie’s stars, since Reeves and Swayze aren’t exactly known for their scintillating acting skills. Reeves offers the usual stiff and monotone performance as Utah. Actually, I’ve always thought that Keanu was a fairly likable presence in his films, but I can’t defend his work from the myriad of detractors. He does best as either a stoner ala River’s Edge or a one-dimensional action hero as in Speed or The Matrix. In the latter examples, Reeves flies highest when he’s really just a cog in a greater universe. Those roles required little than a handsome, charismatic personality, and he could do that. When he is required to provide additional dimension to the parts, however, Keanu has more trouble, which is why his work as Utah seems like a mixed bag. Johnny becomes confused and torn as he integrates with the gang, but Reeves shows no ability to portray those dimensions of his character. On the other hand, Swayze seems surprisingly smooth and loose as Bodhi. Perhaps this is because he really doesn’t need to show many emotions; he’s in control and doesn’t go through as many changes as Johnny. In Ghost, Swayze had a few solid moments, but the range of feelings required in the role harmed him, so it’s good to see that he found a part that was catered more to his restrictions. As Bodhi, he appears to fill out the character’s hedonistic desires and makes him a fairly compelling personality. Bigelow manages to stage the action sequences with enough verve to let us tolerate the character-driven moments. Frankly, I didn’t really care about any of the various folks found in the movie. I assumed Johnny would eventually get his men, but I felt little investment in the outcome. Nonetheless, Point Break provided an entertaining diversion that made it more successful than it could have been. I wouldn’t call it a great action flick, but I thought it did enough well to be a decent one. Bad inside joke alert: at one point, Utah mentions a lunch appointment at “Patrick’s Roadhouse”. This is a reference to Swayze’s 1989 dud Road House. No, it wasn’t terribly clever, but at least they made an attempt to keep the audience on their toes. Point Break appears in an aspect ratio of approximately 2.35:1 on this Blu-ray Disc. The transfer seemed to reproduce the source fairly well. Overall sharpness was good, but exceptions occurred. Interiors tended toward an intentionally hazy feel, and that made them less than detailed. Still, general delineation seemed positive. No instances of shimmering or jagged edges occurred, and I noticed no edge enhancement. Print flaws failed to become a factor. Break featured a pretty subdued and naturalistic palette, with an emphasis on blues and pranges. The colors didn’t hop to life, but they showed reasonable clarity. Blacks varied from dark and deep to somewhat grayish, but they were mostly fine. Shadows also were usually fine, though the smokiness of the interiors meant they could be a little mushy. Overall, this ended up as a good but unexceptional presentation. The DTS-HD MA 5.1 soundfield seemed fairly active. The forward spectrum provided a nice range of ambient effects that were well-balanced and placed appropriately within the mix. Sounds moved neatly across the channels and created a fairly realistic and convincing environment. As for the surrounds, they offered a strong level of interaction during appropriate scenes. For example, beach shots featured good use of waves and other atmospheric noises, and the environment heard during the skydiving scenes could be quite enveloping. This became an involving mix. Sound quality seemed fairly good for the most part. Speech appeared slightly thin and reedy, but I heard no signs of edginess or problems related to intelligibility. While the dialogue lacked much warmth, the lines were clear and distinct. Similarly, effects could be somewhat flat, but they generally offered good clarity, and only a few minor instances of distortion appeared during gunshots and a car chase. Music seemed nicely delineated, with bright highs and solid lows. Actually, these mixes boasted very nice bass response. Ultimately, Point Break featured a solid auditory experience for a somewhat older movie. How does the Blu-ray compare to the Special Edition DVD from 2006? Audio showed better clarity and involvement, while visuals seemed smoother and tighter. I liked the DVD in 2006, but the Blu-ray improved on it. The Blu-ray repeats the DVD’s extras. Eight Deleted Scenes last a total of four minutes, 53 seconds. These include “Holistic Fitness with Agent Pappas” (nine seconds), “Agent Johnny Utah Thinks He Can Surf” (0:51), “Tyler Saves Johnny From the Waves” (0:26), “Penetration of the Social Infrastructure” (1:30), “Tyler and Johnny Spend Time Alone in the Water” (0:57), “A Basic Hit and Run” (0:08), “Tyler Accuses Johnny of Using Her” (0:25), and “Johnny and Bodhi Talk About Robbing Banks” (0:27). That’s not much running time for so many scenes. Of course, two that last under 10 seconds each don’t help. Most of the scenes are very minor additions to existing sequences, and not a single one seems memorable. Next we get a featurette called It’s Make or Break. 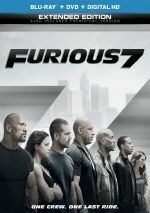 The 23-minute, three-second program offers comments from co-producer/story writer Rick King, screenwriter W. Peter Iliff, producers Robert L. Levy and Peter Abrams, director Kathryn Bigelow, stunt double Scott Wilder and Pat Banta, stunt coordinator/second unit director Glenn R. Wilder, and actors Gary Busey, Patrick Swayze, Keanu Reeves, Lori Petty, John C. McGinley, John Philbin and BoJesse Christopher. Most of the comments come from modern sessions, but some – most notably Bigelow and Reeves – clearly were shot in the early 90s. “Make” looks at the story’s origins and development, how Bigelow came onto the project and her impact on it, cast and characters, shooting the film’s surfing sequences and other action pieces, and reflections on the flick. “Make” is a bit lighter than I’d like, largely because it includes way too many movie snippets. Despite that issue, it provides a pretty decent look at the production. We get some good remarks about the actors and their work as well as info related to stunts and action. I particularly like the details about how they shot the skydiving bits. This is a perfectly competent show. Another featurette appears next. Ride the Wave goes for six minutes, eight seconds and includes Petty, Swayze, King, Scott Wilder, McGinley, Philbin, Iliff, Abrams, Levy, and Christopher. As implied by the title, “Wave” concentrates on surfing, particularly the spirituality side. Those involved throw out vague mystical thoughts about the ocean and nature as well as the depiction of surfers in the film. This doesn’t add up to anything particularly intriguing. After this we get a featurette entitled Adrenaline Junkies. The six-minute, one-second show presents notes from Swayze, Glenn R. Wilder, Banta, Scott Wilder, McGinley, Christopher, Iliff, Abrams, Philbin, Busey, Petty, and King. “Junkies” concentrates on the pursuit of risky activities and those depicted in the film. We learn a bit about skydiving and what scary things the participants like to do. All of this stays more general than I’d like, so we don’t really learn anything not already found in “It’s Make or Break”. Finally, On Location: Malibu lasts eight minutes, 32 seconds. It features Christopher and Philbin in Malibu as they lead us on a little tour of that location. They give us info about shooting the flick and aspects of the beach elements used in the film. I like the story about beach football and the poster shoot, and we get some nice material in this fun piece. The set ends with three . One runs about two minutes, while the others go for about one minute each. Point Break doesn’t have the stuff to be an action flick classic. Nonetheless, I thought it was a generally entertaining and well-executed romp that avoided some of the goofier excesses of the genre. The Blu-ray offers decent picture and supplements with above-average audio. Silly but fun, Point Break entertains.